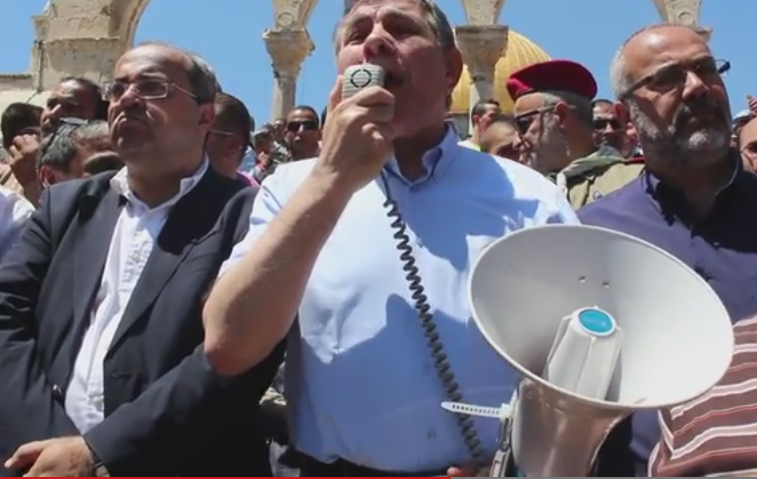 No, not the handing over of the Temple Mount precincts totally to the Muslim Waqf. Not at all, although "Jewish" does sneak in. Despite these protections, in December 2014, Congress promised to hand the title for Oak Flat over to a private, Australian-British mining concern...Congress has handed over a sacred Native American site to a foreign-owned company for what may be the first time in our nation’s history. ...“Why is this place sacred?” said Wendsler Nosie Sr., a former chairman of the San Carlos Apache, in a recent interview with Cronkite News. “No difference to Mount Sinai. How the holy spirit came to be.” If you don’t want to take his word for it, the archaeological record at Oak Flat contains abundant evidence that the Apache have been here “since well before recorded history,” according to congressional testimony by the Society for American Archaeology. If only the NYTimes would allow an op-ed that would express pro-Jewish rights on the Temple Mount. Ah, but by then, Messiah would have come. The drumbeat of war on distant horizons is reverberating through Southeast Asia with increasingly strong declarations of U.S. determination to stop the Chinese from expanding their writ over the South China Sea, notably islands claimed by the Philippines, Vietnam, Malaysia and Brunei. While Defense Secretary Ashton Carter was in Singapore vowing that U.S. planes and ships would go wherever they wanted in international waters WAT -0.71%, the U.S. navy missile cruiser Shiloh was hoving into view at the historic Subic Bay port northwest of Manila. Reports of Carter’s tough remarks at a gathering of defense ministers and the Shiloh’s visit to Subic Bay, the largest U.S. navy base before the Americans were forced to give it all up more than 20 years ago, were couched in euphemisms that scarcely masked the impression of spiraling tensions. “We want a peaceful resolution of all disputes,” Carter began. “A routine port call,” said a Philippine navy spokesman when asked what the Shiloh was doing at Subic Bay, in the once roaring American base town of Olongapo. How far is the South China Sea from the United States and how far is the 'West Bank' (Judea and Samaria) from Israel? 1. "It was Lehi that began the terror war against the British in 1940". After Raziel's arrest, Hanoch Kalai, his deputy, was appointed Commander in Chief. 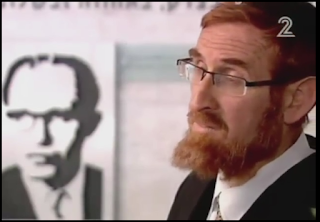 Avraham Stern, who was then in Poland, was summoned back to Palestine and appointed head of the Information Department. The other members of the General Headquarters remained in their positions. At the first meeting of the General Headquarters under Kalai, it was decided to launch a second front against the British administration in retaliation for the publication of the White Paper. In accordance with Irgun procedure, the jailed commander was not consulted, and Raziel did not take part in decision-making. And Cairns and a colleague, Ronald Barker, were assassinated by an Irgun land mine on 26 August 1939 in Rehavia, Jerusalem, on the orders of then Irgun leader Hanoch Kalai. 2. "a poem written by Stern, which would become Lehi’s anthem". True. But it was first the Irgun's anthem until Stern split off. 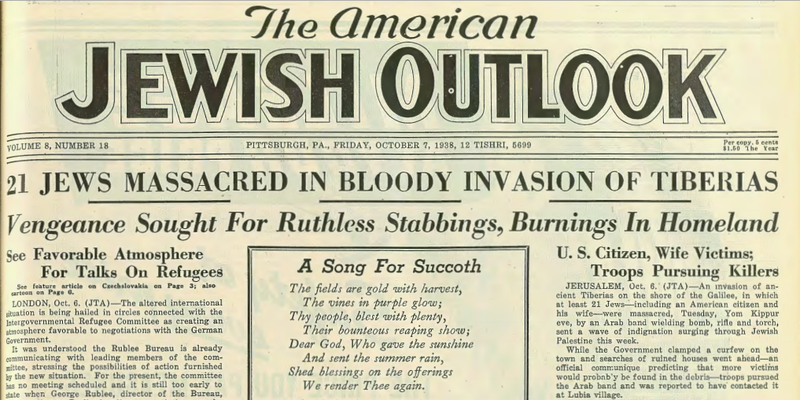 The Irgun then adopted the thrid stanza of the Betar anthem. 3. "Stern was killed by the British in 1941". February 1942. Raziel was killed, in Iraq, in 1941. 4. 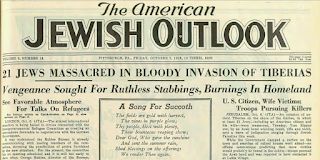 "after a successful British counter-terror operation, in which most of the Zionist leadership was rounded up, Ben-Gurion called off the Haganah". Even before that operation, the 'Black Sabbath', Chaim Weizmann had been demanding the Hagana halt it terror campaign. B-G opposed it and he and Moshe Sneh left for Europe to fight for its continuation. There was a July 30th operation in Tel Aviv but that didn't affect the decision to halt the United Resistance Movement actions by the Hagana and Palmach as on August 22, Palyam frogmen attached a limpet mine to the side of the British cargo ship Empire Rival, which had been used to deport Jewish immigrants to Cyprus. A hole was blown in the ship's side. That is quite a narrow time-frame. Since the war, 338 British subjects had been killed in Palestine, while the military forces there had cost the British taxpayer 100 million pounds. After Prime Minister Levi Eshkol’s modest liberalization in 1963, it seemed the days of conquering the land had ended. But the Six-Day War halted the attempts to ratchet down the conquering nationalism and gradually shift to a situation in which tribal particularism could be tamed by the universal principles of democracy. I have always posited that the 1948 war was but stage one and that the war of 1967 was but a continuation of Zionism's liberation struggle. “Whereas recognition has been given to the historical connection of the Jewish people with Palestine and to the grounds for reconstituting their national home in that country. “In the territories lying between the Jordan and the eastern boundary of Palestine as ultimately determined, the Mandatory shall be entitled, with the consent of the Council of the League of Nations, to postpone or withhold application of such provision of this Mandate as he may consider..."
On the North it is bounded by the French Mandated Territories of Syria and Lebanon, on the East by Syria and Trans-Jordan, on the South-west by the Egyptian province of Sinai, on the South-east by the Gulf of Aqaba and on the West by the Mediterranean. So Sternhell's "claim of colonialism", if correct, which it isn't, would define all of the state of Israel as an unworthy project. all Zionism’s goals had been attained within the existing borders. But even that tiny spark of normalization was obliterated by the great victory of ‘67. Of course, a little matter of the local Arabs not recognizing, never having recognized and so far, still refusing to recognize any border acceptable to them does not configurate his thinking (and I apply that term hesitantly), not to mention the Arab terror. It's all Israel's/the Jews' fault. We took, he implies, what wasn't ours. The Arabs-who-refer-to-themselves-as-'Palestinans' were, he would have us assume, an equal people, with equal political rights, with an equal national heritage and possessed an entity akin to a state. And this is a university professor. What Will The Concessionists Say Now? concisely, pithily and to the point. One of the central points of those who support the policy that Israel should withdraw from the territories of its historic homeland, yield, surrender and concede and partition land, is that the US will come to our assistance if Israel is threatened. And you believe that? That if it would want to, it could? In time? Nearly one year after the ISIS hordes charged screaming over the Syrian border and sacked Mosul, they’ve repeated the feat in Ramadi – the capital of the restive Anbar province, and a city located just 70 miles from Baghdad. Simultaneously, ISIS forces launched an offensive to the north and captured the ancient Syrian city of Palmyra. In the face of this humiliation more than nine months after the start of renewed coalition bombing missions over Iraq, the White House dubiously continued to insist that everything was going according to plan. Except, there never was any plan. Are you sure America can perform militarily if Israel requires help if we retreat from the hills of Samaria and Judea? In time? Adequately and resolutely? Did Netanyahu Off the NYTimes? Israel's PM Benjamin Netanyahu berated the New York Times for its coverage of Israel? That the paper was engaged in meddling in Israel's affairs with a critical editorial, angrily telling the US daily to “know your place”? Did he blast an “impolite” editorial in the New York Times last week which he said “literally gave orders to the United States”? Did he say in a televised speech in Jerusalem, “As a newspaper, you [the New York Times] should know your place”? And "You are meddling in Israel’s affairs by writing something like this. By publishing this editorial, you are overstepping the limits of freedom”? President Recep Tayyip Erdogan on Monday accused the New York Times of meddling in Turkey’s affairs with a critical editorial, angrily telling the US daily to “know your place”. In a growing controversy over media rights in Turkey ahead of 7 June legislative polls, Erdogan blasted an “impolite” editorial in the New York Times last week which he said “literally gave orders to the United States”. “As a newspaper, you [the New York Times] should know your place,” he said in a televised speech in Istanbul. “You are meddling in Turkey’s affairs by writing something like this. By publishing this editorial, you are overstepping the limits of freedom,” he said. Of course, it would have been nice but we're so polite. 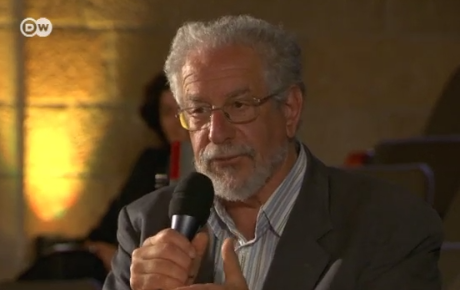 On May 14, I participated as an audience observer in Tim Sebastian's New Arab Debates' series in Jerusalem on the question "MOTION: The occupation is destroying Israel". I even managed to ask a question, at 18:50. And Tim shook my hand after the show, recalling my appearance on his HardTalk program, back in May 2003.
that same damage from the occupation, against which Berrin warned, pursued him to a conference hall in Jerusalem and then sent him to prison for a week. 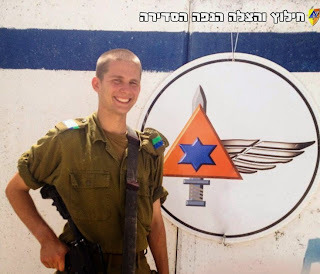 In the words of the IDF Spokesperson’s Unit, “The soldier was tried for speaking to the media without authorization and approval, as required by army orders.” Or, put more simply, the soldier was tried and jailed for telling the truth, contrary to the army’s orders. That formulation is, of course, a perversion. The rule of not talking to the press applies to all ranks, in all situations and has nothing to do with the topic and certainly not with any so-called 'occupation'. If we take the Haaretz logic to its conclusion, the Bat Ayin soldier, Eldad Sela, who revealed, it is charged, army plans to dismantle outposts, was also simply expressing the truth and is unjustly being punished? And by the way, he is accused of espionage, a much more severe punishable crime. Or is only anti-occupation actions and words to be granted a special treatment of unlimited liberty? I also raised another concern—one that the president didn’t seem to fully share. It’s been my belief that it is difficult to negotiate with parties that are captive to a conspiratorial anti-Semitic worldview not because they hold offensive views, but because they hold ridiculous views. As Walter Russell Mead and others have explained, anti-Semites have difficulty understanding the world as it actually works, and don’t comprehend cause-and-effect in politics and economics. Though I would like to see a solid nuclear deal (it is preferable to the alternatives) I don’t believe that the regime with which Obama is negotiating can be counted on to be entirely rational." “Applying double standards by requiring of [Israel] a behavior not expected or demanded of any other democratic nation” is within President Obama’s own State Department definition of anti-Semitism. #1. "Prime Minister Netanyahu said a Palestinian state would not happen under his watch". This is the SAME thing Mr. Obama HIMSELF said last week (Al Arabiya 15 May 2015): "And what I think at this point, realistically, we can do is to try to rebuild trust -- not through a big overarching deal, which I don't think isprobably possible in the next year, given the makeup of the Netanyahu government, given the challenges I think that exist for President Abbas." a. Inspection regime to exclude any serious inspection of Iranian military sites that may conceal nuclear program.b. Inspection regime inside nuclear facilities to exclude live monitoring (prohibit video feeds that might provide images of Iranian nuclear scientists)c. Ongoing development and construction of advanced centrifuges to slash break-out time permitted.d. Ongoing development, construction and even deployment of delivery systems for nuclear weapons permitted. #4. A profoundly bizarre claim: "They [Iran] are not a threat to the region because of their hardware. " #5. A disturbing remark hinting at a policy of relying on Iran in the neighborhood: "How do we find effective partners to govern in those parts of Iraq that right now are ungovernable and effectively defeat ISIL, not just in Iraq but in Syria?" Is that really so – or is Benjamin Netanyahu, known for historic declarations that do not always accord with the historical truth, once again mistaken and misleading the masses? Jerusalem, according to scientific research, has existed for about 4,000 years. During the first 1,000 years it had no connection to the Jewish people. Even in the Bible, the Book of Genesis tells about Melchizedek, the king of Salem, who came out to bless Abraham, who had no connection to Jerusalem. During the time of the patriarchs, Jerusalem did not figure in their activity at all. Even when the Israelites were in Egypt, Jerusalem was never mentioned, and when they wandered in the desert they spoke about the Land of Canaan – but not about Jerusalem. The conquest of "the land" by Joshua, son of Nun, did not include taking over Jerusalem. It was actually the king of Jerusalem who organized the coalition of five monarchs against Joshua, and at the time the city was apparently the capital of another nation, not the Israelites. What a staggeringly dumb article. "During the time of the patriarchs, Jerusalem did not figure in their activity at all." Are there alternative theories about where Mt Moriah was? Some traditions have an alternative site near Mecca. So yeah - checkmate. Which is where Abraham offered his son Yishmael as a sacrifice to God. so David conquered Jerusalem only 3000 years ago. Jews were here through all that time except for periods when various conquerors specifically prevented Jews from being here, as after the crushing of the Bar Kokhba revolt, in the period after Constantine up to the Arab conquest [see, the Arabs did something good, they let Jews come back to Jerusalem] and during the Crusader period. Again, since 1000 BCE, Jews/Israelites were always here except when specifically excluded. As to the Temple Mount, it is identified in the Bible as Mt Zion. Today's Mt Zion outside the Zion Gate takes its name from a Byzantine church there called the Nea Sion [its ruins are next to the parking lot in the Jewish Quarter]. This is not the original Mt Zion. As to Mt Moriah I don't think anybody knows where it is/was. The practice of naming Mt Zion/Temple Mt/ as Mt Moriah started with the Talmud, not the Bible. Ridiculous. By this standard, nobody on earth has a valid capital city. Did Biger get paid to write this? Embarrassingly stupid. Perhaps he can explain why it appears 669 times in the Tanakh (not counting other equivalent references such as Zion). How long has Paris been capital of the French? 2000 years ago, Paris was called Lutetia and was small settlement on a mud spit in the middle of the Seine river. It may have become the capital about 1000 years ago, roughly speaking. But 2000 years ago nobody called the country France, it was just Gaul. Cairo did not exist 2000 years ago. Damascus did exist 2000 years ago, but the people there did not speak Arabic and were not Arabs (there were probably some Arabs around). There was no Tunis and no Algiers. But Weren't the "Pals." Here First? The ancient acqueduct was built under the villages? A section of Jerusalem’s Lower Aqueduct, which conveyed water to the city more than 2,000 years ago, was exposed in the Umm Tuba quarter (near Har Homa) during the construction of a sewer line in the neighborhood by the Gihon Company. This line is just part of an extensive project directed by Zohar Yinon, CEO of the Gihon Company Ltd, to install a modern sewer system for the benefit of the residents of Umm Tuba and Sur Bahar. The Israel Antiquities Authority conducted an archaeological excavation there following the discovery of the aqueduct. According to Ya’akov Billig, the excavation director,“The Lower Aqueduct to Jerusalem, which the Hasmonean kings constructed more than two thousand years ago in order to provide water to Jerusalem, operated intermittently until about one hundred years ago. The aqueduct begins at the ‘En ‘Eitam spring, near Solomon’s Pools south of Bethlehem, and is approximately 21 kilometers long. Despite its length, it flows along a very gentle downward slope whereby the water level falls just one meter per kilometer of distance. At first, the water was conveyed inside an open channel and about 500 years ago, during the Ottoman period, a terra cotta pipe was installed inside the channel in order to better protect the water”. The Umm Tuba section of the aqueduct was documented, studied, and covered up again for the sake of future generations. I was privileged to attend tonight the opening of a special display of a Mishneh Torah, the classic Halachic codex of the Rambam, commissioned and completed ca. 1457 in northern Italy and illustrated in the Renaissance style of the time. 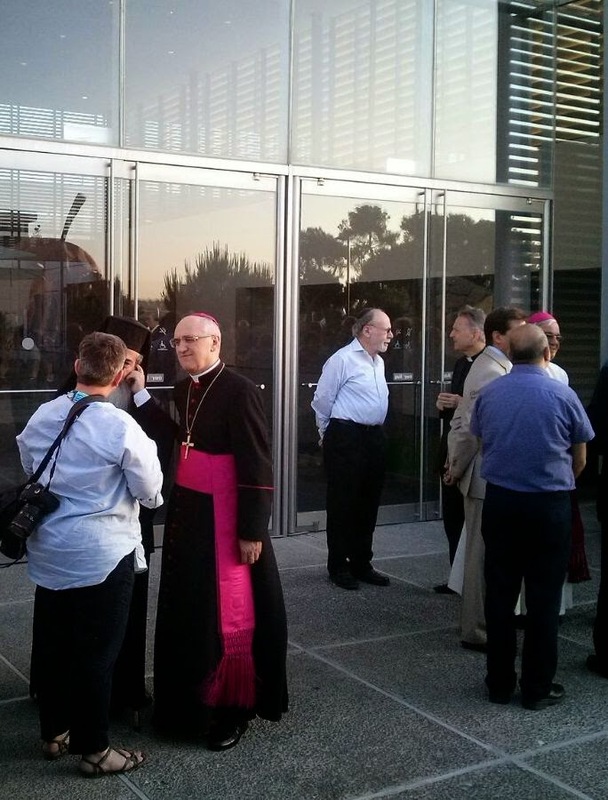 It was at the Israel Museum in the presence of the Rishon Letzion Yitzchak Yosef, the Apostolic Nuncio in Israel Archbishop Guiseppe Lazzarotto, Msgr. Cesare Pasini, the Vatican's Prefect of its Biblioteca Apostolica with a nice talk by Prof. Moshee Halbertal who spoke of the Rambam's approach that to be religious, one must learn to love, which is beyond fearful respect and can only be achieved through knowing God which, in turn, can only be gained by learning of his works in nature. The two halves of the volume were separated some two centuries ago and ended up in the Vatican and in Germany and that second Jewish-held half was only recently located and purchased by the Israel Museum jointly with New York's Metropolitan Museum. P.S. The title of the evening was a play on words - יד ביד - which is 'Hand in Hand' - but refers to the fact that the Rambam's work contained 14 sections which, in gammatria is יד, I think was lost to many of those who attended. 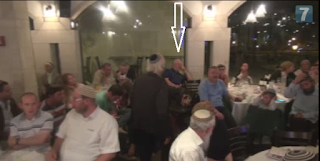 To Who Was President Rivlin Referring? He couldn't be referring to President Rivlin here, could he? I have nothing but regret for the discordant voices that we heard this morning, supporting the separation between Jews and Arabs on the basis of ideas that have no place being heard or said. Such statements go against the very foundations of the State of Israel, and impact upon our very ability to establish here a Jewish and democratic state. Such statements cause great damage to the State of Israel, and to the settlement movement. It is important we remember that our sovereignty obligates us to prove our ability to live side by side." "This morning, (Wednesday May 20th), as we witnessed the terror attack in Jerusalem we received a painful reminder of the complex security situation Israel's faces and the price we pay for our basic principles. We must confront terrorism firmly, whilst defending our democratic values ​​as a country and as a people. I spoke this morning with the Minister of Defense, and I welcomed halting the process that could have led to an unthinkable separation between bus lines for Jews and Arabs. "As one who loves the Land of Israel, I have nothing but regret for the discordant voices that we heard this morning, supporting the separation between Jews and Arabs on the basis of ideas that have no place being heard or said. Such statements go against the very foundations of the State of Israel, and impact upon our very ability to establish here a Jewish and democratic state. Such statements cause great damage to the State of Israel, and to the settlement movement. It is important we remember that our sovereignty obligates us to prove our ability to live side by side." Was this in anyway connected to today's terror incident when an Arab resident of Jerusalem ran over two Border Policewomen? Police officers on Tuesday afternoon shot and wounded a man who accelerated a vehicle in their direction, a spokesman said. The shooting happened in the parking lot. They were conducting an investigation when "a suspect accelerated his vehicle in the direction of two of the officers," according to a spokesman. Both officers opened fire, wounding the suspect. The man, who suffered non-life-threatening injuries, was taken to a hospital. Federal agents on Tuesday afternoon shot and wounded a man who accelerated a vehicle in their direction outside a West Palm Beach furniture store, a spokesman said. The shooting happened in the parking lot of El Dorado Furniture at 1901 Okeechobee Blvd. Special agents with U.S. Immigration and Customs Enforcement's Homeland Security Investigations were conducting an investigation when "a suspect accelerated his vehicle in the direction of two of the agents," according to Nestor Yglesias, an agency spokesman. Both agents opened fire, wounding the suspect. The man, who suffered non-life-threatening injuries, was taken to a hospital. learn their stories, and discover first-hand the touchstones of West Bank life. Join Extend on its upcoming tour of the West Bank, this June 8-12. Palestinian perspectives on the conflict. get into deep conversations with people of myriad perspectives, are encouraged to apply. The cost of the 5-day program is $300. Morning: Visit to All For Peace Radio Station, award-winning joint Israeli-Palestinian radio initiative. Early afternoon: Visit to the Austrian Hospice for a chat with a filmmaker and Ph.D student in George Mason's conflict resolution program, on how to reconcile dueling Israeli-Palestinian narratives on the conflict. Late afternoon: Walking tour of East Jerusalem with a Palestinian resident of the city. The walk explores the complex politics of the city, divided Arab-Jewish neighborhoods, and home demolitions. Morning: Tour of Hebron with Breaking the Silence, an organization that offers tours of the West Bank led by former IDF soldiers with a critical perspective on Israeli policy in the West Bank. Late afternoon: Meeting with the English-language spokesperson for the Hebron settler movement and a tour of the Hebron settlement. Evening: Dinner in Bethlehem with a former Palestinian combatant and member of Hands of Peace. Morning: Trail walk through the hills outside of Bethlehem with a settler disciple of Rabbi Froman, a rabbi committed to achieving peace between settlers and Palestinians. During the trail walk participants discuss the Jewish and Palestinian connection to the land. Early afternoon: Tour of villages within the Gush Etzion settlement. Introductions to a wide array of settlers. Evening: Dinner outside Ramallah with Palestinian peace activists at a Palestinian home. Morning: Nabi Saleh: Visit a family in this small village that is at the heart of the protest movement, and learn about the village's weekly protest and tensions with nearby settlements. Afternoon: Bi'lin: Meet a number of local activists in this village and learn about the nonviolent protests that culminated in an Israeli high court decision to reroute the Wall. Evening: Discussion with former PA officials on negotiating policy, divides within Palestinian society, and more. Morning: Conference with international lawyers from Military Court Watch on the West Bank legal system. Visits to Palestinian families who have gone through the legal system. Afternoon: Meeting with prominent Palestinian businessmen on their ideal economic relationship to Israel. Evening: The tour concludes once everyone has been deposited in Jerusalem! Everything seems quite clear except whether the "former PA officials" also were terrorists, or are. and, therefore, despite MKs' immunity, he will not allow such 'behavior'. So, you would presume only Jews wish to alter the status quo. and he is demanding a Muslim-only approach (hear him here). Isn't that campaigning for the altering of the status quo? I can only presume that the pro-Mulsim status quo is even more sacred than the Temple Mount's sanctity for the Jews or the lawful right of Jews to pray there. And that being so, I can further presume that Danino prefers even more anti-Jewish incitement by Muslim Arabs, supported by a MK, rather than the protection of Jewish rights. That is a very sorry state of affairs. I would have suggested Danino go back to bed but I feel that would unfairly implicate him in other police activity. Is Netanyahu Down In the Dumps? It started in 1996, then the owner of the store over the basement was abducted under orders of Arafat, who was asked by Egypt's Mubarak to persuade him to give basement to Copts but he refused, was then referred to as a Subterranean volcano in 2009 and by 2010, we were updated about the ownership of a long-forgotten medieval cellar that for centuries has been filled with rubbish. The cellar, which dates to at least the 12th century, lies in Jerusalem, and is claimed by both a Palestinian Muslim shopkeeper and Egyptian Coptic Christians who have responsibility over part of the Church of the Holy Sepulchre, one of Christianity's holiest site. The legal battle over the centuries-old vaulted stone cellar has been festering for 14 years...Antonios al-Orshaleme, general secretary of the Coptic Orthodox Patriarchate in Jerusalem, insists the basement is holy ground and was once part of the Church of the Holy Sepulchre, revered by most Christians as the site where Jesus Christ was crucified and buried. ...The church was built in the fourth century. Its destruction seven centuries later provided an impetus for the Crusades. It was rebuilt in 1048 following agreement between the Byzantine Empire and the region's Muslim rulers. "Here is a monastery, below is also a monastery," says Orshaleme. Not so, says lawyer Reuven Yehoshua, who represents storekeeper Hazam Hirbawi. "For 800 years this cellar was used as a garbage dump," says Yehoshua. And, basically, PM Binyamin Netanyahu may have to resolve it. The owner is dead but his son and his Israeli lawyers keep on. 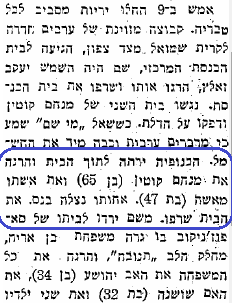 This week, a report (in Hebrew) indicates the decision was that thee cellar belongs to ... Hirbawi. 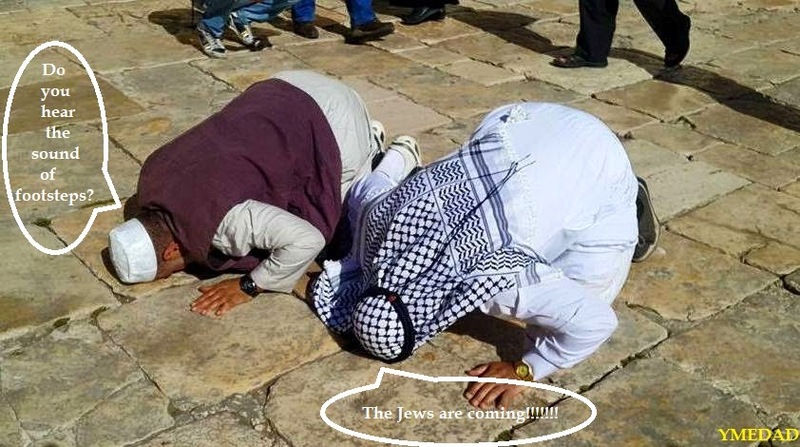 And you thought the Temple Mount was the only troublesome holy site? Ramadan will be starting June 18th and ending mid-July. 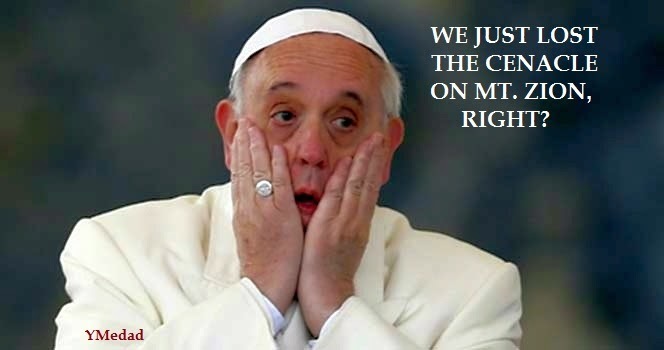 Vatican To Lose Mount Zion? The Vatican will be recognizing some entity that calls itself the 'state of Palestine'. If it ever thought that after years of negotiations it will now obtain more than just a right of access to the Cenacle on Mount Zion, a revered Jewish site, I think that's a no. Or that should be a no. In 1537, Jews managed to expell the Franciscans from the site, which was a Jewish synagogue, after they took it over in the early 14th century. And now, Qurei is condemning the "storming of Al-Aqsa" and the "performance of Talmudic prayers"
If we perform Biblical prayers, is that okay? But, of course, using the term "Talmudic" is anti-Semitic. Member of the Executive Committee of the Palestine Liberation Organization Chairman Affairs Department Jerusalem Ahmed Qurei warned of the risks and repercussions of the storming by a radical settler groups to the courtyards of Al-Aqsa Mosque through the Mughrabi Gate, heavily protected and enhanced by special units of the Israeli occupation police, who do many tours and violations. He stressed the seriousness of the attempt settler extremist perform Talmudic prayers on the cusp of the series door inside the Al-Aqsa Mosque in a provocative step to the feelings of Muslim worshipers, describing it extremism and blunt aggression on Al-Aqsa and the holy sites in Jerusalem, with the aim of desecration, and the imposition of policy the status quo and make a normal intrusion process, all the way to give these extremists an opportunity to establish prayer in Al-Aqsa Mosque. And he formulated with Shimon Peres the Oslo Accords as a 'moderate'. At least they acknowledge that denying the Temple is stupid and silly. Anyone have knowledge of the Kabni family? and he arrived four years previously and was a synagogue gabbai. At What Time Do You Decide?